Our team has accumulated a vast wealth of knowledge and experience when it comes to repairing and installing automatic garage door systems, allowing us to undertake even the most complex of jobs. Count on us any time you need a professional to help you out. Our company works with all of the industry's leading brands, from Marantec to Liftmaster and can help out with any replacement part and installation. If you're in need of a new opener, our experts can help you find the perfect model for you, be it a powerful chain-drive type or a smooth and silent belt-drive one. We can also make recommendations when it comes to safety and security to ensure your property has the protection it needs. The type of springs you have makes no different to us, as our technicians are fully capable of adjusting or replacing these dangerous components regardless of their type and manufacturer. Since these components are under a lot of stress on a daily basis, dealing with them requires an expert. Count on us to perform the necessary procedure without jeopardizing anyone's safety. The scheduled service appointments we provide will make sure your system and all of its parts remain in a great working condition. For example, we'll examine every inch of your opener, lubricate its axis and chain (if it has one) and perform all of the necessary safety sensor tests to ensure that your garage door poses no safety hazard. 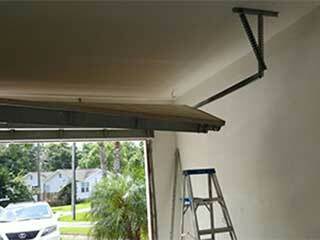 Our team at Garage Door Repair Diamond Bar is a leading service provider in California. We can help you whatever the type of problem you may be experiencing, and our experts are always happy to give out professional advice.